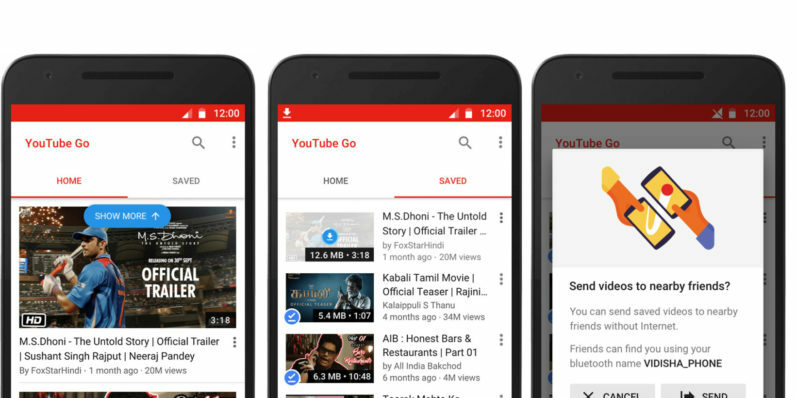 At its Google for India event in New Delhi today, the company announced a new mobile app designed with users in India in mind: YouTube Go. The app brings YouTube to your mobile device with a slew of options to help you save on your carrier’s data fees and to work in areas with poor connectivity. YouTube Go features video previews in the form of slideshows for each clip, so can get an idea of what it’s about before you stream or save it to your device. You can also see its file size before downloading, along with how much storage space you have left on your phone. It also lets you send videos to others near you over Bluetooth – allowing you to share without having to worry about spending on data a second time. The app builds on Google’s previous efforts to make YouTube more easily accessible to people in areas with slow connections and expensive data. Two years ago, it enabled offline playback on the platform for Android users; in June, it announced Smart Offline, a feature that automatically downloads selected videos during time slots when data is cheaper or free on your mobile network. YouTube Go will become available to test soon; the company hasn’t announced an official date, but users in India can sign up on this page to be notified when it arrives.